As engine power and torque levels increase, Powergrip Clutch sets meet the challenge. A Powergrip utilizes a unique blend of 900 and 300 series friction materials and increased clamp loads to give you the holding power needed for aggressive street driving. As power levels move up to and beyond 500 horsepower. 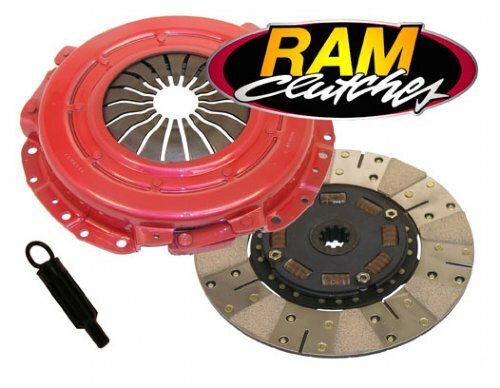 RAM POWERGRIP meets the challenge with a combination of organic and metallic disc friction surfaces that effectively increase the clutch capacity to the 550 horsepower level. The 8-spring hub is equipped with RAM POLYCOIL damper springs encapsulated in polyurethane. This spring can handle three times the shock load of just the coil spring, and is standard in all RAM competition discs. The RAM Competition pressure plate in this kit provides 30% more clamp pressure than stock, and meets SFI specifications. At this high level of performance RAM POWERGRIP provides surprisingly good driving characteristics with smooth, comfortable driver control. Sets include pressure plate, disc, and alignment tool unless otherwise noted.